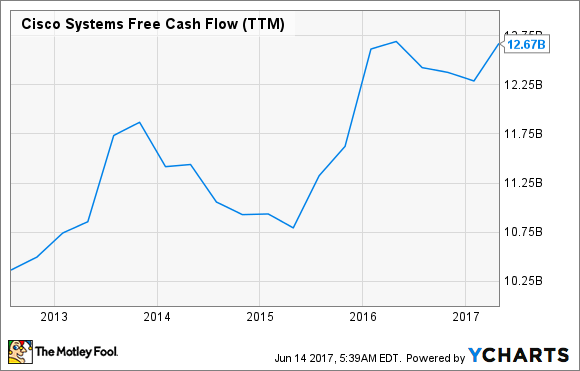 How Safe Is Cisco Systems and Its Dividend? A low P/E and a high yield make this "boring" mature technology stock a fairly safe income play. The valuations of many dividend stocks have become inflated over the past few years, due to an eight-year bull market and low interest rates pushing income investors toward dividend stocks. Therefore, income investors should take a moment to see if a market downturn or rising interest rates could crush any of their dividend plays. One dividend stock I frequently recommend is Cisco (NASDAQ:CSCO), the slow-growth networking-hardware giant that pays a reliable forward yield of 3.7%. But just how safe are Cisco's business model and dividend? How safe is Cisco Systems' business model? Cisco is one of the biggest manufacturers of routers and switches in the world. Revenue from those two product categories accounted for 46% of its top line during the first nine months of fiscal 2017. Unfortunately, sales for both routers and switches have been sluggish, respectively falling 2% and 4% annually during that period. That slowdown was caused by diminished enterprise spending, macroeconomic challenges in certain markets, and the growing use of "white box" generic hardware, which runs on open-source software. These cheaper solutions use software-defined networking (SDN) solutions to disrupt Cisco's traditional business model of selling its hardware, software, and services in a seamless bundle. Cisco's fastest-growing rival in that space is Arista Networks (NYSE:ANET), which sells cheaper networking hardware tailored for SDN uses. Cisco has repeatedly tried to kneecap its competitor with patent litigation, but Arista continues posting double-digit sales growth year after year. Meanwhile, Cisco is expected to post a 3% sales decline and 1% earnings growth this year. To get its growth back on track, Cisco is investing heavily in its higher-growth areas such as cybersecurity. Cisco's security revenue rose 12% annually during the first nine months of 2017, but that accounted for just 4% of its top line. Its wireless unit -- which posted 5% sales growth and accounted for 5% of its revenue -- is another potential area of growth. Unfortunately, the growth in those businesses isn't nearly enough to offset the slowing sales of the company's routers and switches. Cisco looks like it's stuck in neutral, but it still has plenty of cash ($12.7 billion in free cash flow over the past 12 months) to pursue additional acquisitions to boost its revenue, or repurchase shares to support its earnings growth. Therefore, Cisco isn't swimming forward, but it can certainly keep treading water for the foreseeable future. How safe is Cisco's dividend? Cisco's 3.7% yield is much higher than industry rival Juniper Networks' (NYSE:JNPR) 1.4% yield and the S&P 500's average yield of 2%. Cisco has raised its dividend every year since introducing it in 2011. Juniper introduced its dividend in 2014, but hasn't ever raised its payout. To understand how "safe" a dividend is, investors should check a stock's payout ratios -- or the percentage of a company's earnings or free cash flow (FCF) that goes toward dividends. If either ratio exceeds 100%, then the dividend could be cut. If the ratios are on the low side, the company has room to raise its dividends. So is Cisco a "safe" dividend stock? Some investors consider Cisco a "boring" slow-growth stock, but big and boring stocks generally withstand market downturns better than high-growth ones. Cisco is also a fairly cheap stock at 16 times earnings, which is well below the industry average of 30 for communication-equipment makers. Therefore, the stock's low P/E and high yield should limit its downside. But over the long term, investors should watch how Cisco handles disruptive challengers like Arista. If it fails to address market shifts effectively, it could fall behind the tech curve and underperform the broader market.